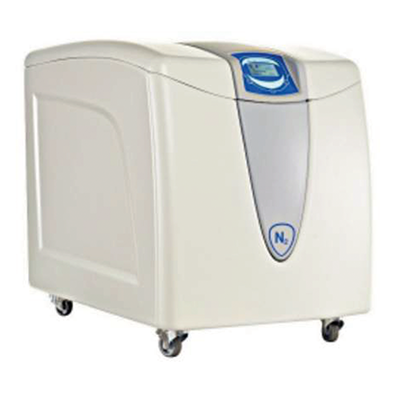 The nitrogen generator has been specifically designed to meet the gas flow, purity and pressure requirements of LCMS instruments. It can be used also for solvent evaporation. The Nitrogen generator uses pressure swing adsorption technology (PSA) combined with a pressure management in two steps to produce pure nitrogen gas with a high flow, pressure and purity. Production of a constant flow of gas improves the consistency of the analysis results and hence reproducibility. The relatively high gas volumes required by LCMS instruments make cylinder supply inappropriate for such applications. A constant, uninterrupted gas supply eliminates interruptions of analyses to change cylinders. Quick return on investment < 1 year. No gas cylinder rental bottles, no price inflation. The 2-stage pressure design allows the two compressors to work at their optimum pressure range which is reducing the stress on the compressors and as result extending the life time of the compressors - which is a considerable saving. Nitrogen produced at low pressure and ambient temperature removes the hazards associated with high pressure cylinders and liquid Dewars.